Was born in 1839. His first racing yacht was the 48-ton cutter Sphinx, which he bought in 1867. She was a very successful racing boat, and on June 1, 1868, won the first prize in the first race organized by the New Thames Yacht Club. She won first prizes on three con­secutive racing days—viz., May 21, 22, and 24, 1869, the total value of these prizes being £300. In the New Thames Match on June 1, 1868, she was run into by Vindex whilst turning to windward on the starboard tack, and although much damaged won the first prize, as well as the first prize of the Royal London Yacht Club, which was resailed simultaneously. The value of these two prizes was £178 15s. Leah, Ketch, 98 tons. Mr. J. S. Earle. In 1876 Mr. Earle bought the yawl Leah, 104 tons, built by Wanhill of Poole, and used her for cruising purposes. Her rig was altered in 1903 to a ketch, and she is still in commission as a cruiser. 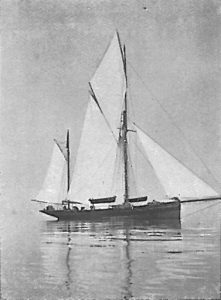 He also owned the cutter-yacht lanthe, 13 tons. This, boat, which had a draught of 6 feet, he used in the various rivers of Essex and Suffolk, and with the Rev. Edmund Farrer visited the numerous churches for archaeological and heraldic researches. In 1878 he was elected Commodore of the Royal London Yacht Club. From 1867 to 1901 James Chaplin of Brightlingsea acted as his skipper. 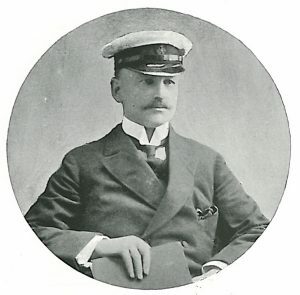 In 1902, owing to ill-health, he was compelled to give up sailing, and his son James Henry Chaplin took his place. Clubs: Royal Thames, Royal Harwich. Residence: 11, Pem­bridge Gardens, W.